MEXICO CITY--Mouser Electronics is proud to announce its sponsorship of the GEOX DRAGON Formula E Team throughout the 2018–19 racing season. Mouser is backing the team this year in collaboration with TTI, Inc. and valued suppliers Molex and AVX. This marks the fifth-straight year that Mouser and Molex have sponsored Formula E racing. The Mouser-sponsored team takes to the 2.093 km Autódromo Hermanos Rodríguez track at the Mexico City E-prix on February 16. GEOX DRAGON was founded in 2006, by Owner and Team Principal Jay Penske. 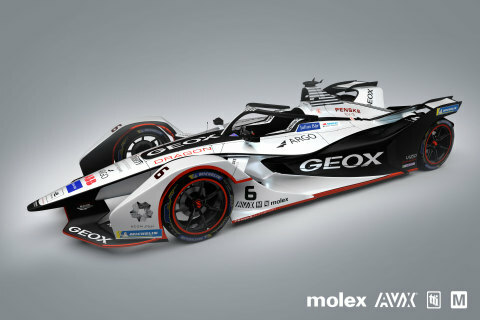 GEOX DRAGON is headquartered in California (Los Angeles), the largest EV market in the world, and has additional racing operations in Britain (Silverstone, UK). In 2014, GEOX DRAGON became one of the three founding teams of the FIA Formula-E Championship. The team finished Runner-Up (2nd place) in the Championship in 2015 and scored the first ever Formula E race wins in both Germany and Mexico in 2016 and 2017. GEOX DRAGON develops its powertrains under the Penske Autosport marque. The team’s engineering and mechanic personnel are some of the finest and most experienced engineers and crew in the world, collectively accumulating over 185 years of racing experience, and achieving over 220+ race wins and 17 Championship titles. GEOX DRAGON’s pilots for Season 5 include three-time World Touring Car Driver’s Champion and multiple FIA Formula E podium finisher José María López and Formula 2 race winner and GEOX DRAGON test and reserve driver Maximilian Günther.